Italian Traditional Fried Feast Dough, Italian Pizza Fritta or well known as Zeppole! If you have never tried fried pizza dough, you are missing out. This is a special Italian treat we make often here in our home. Mom would start our Sunday breakfast off with this delicious fried dough before our big traditional Sunday Sauce meal. We always looked forward to Sunday morning with that fresh smell of fried dough. This is a specialty at every American Italian church feast in Upstate New York. Utica, New York is noted for the best homemade fried dough at all the church events during the summer months. It's usually fried right in front of you and served with either sugar or powdered sugar in paper bags. Fried dough, Pizza Fritta, Pizza Fritte, Fried Doughnuts, Zeppole, Funnel Cakes, Beignets, Johnny Cakes are just a few names of fried dough. There are so many versions. Italian fried dough is pizza dough, deep fried and sprinkled with either powdered sugar or granulated sugar. Carnivals, feasts, outdoor picnics, and backyard events, often make these dessert treats to serve. Whether you make this on the stove top, side burner on the grill, fireplace or deep fryer, it sure is easy and tasty! Fried dough is popular throughout the world in so many shapes and forms. The Italian version is simply pizza dough is sprinkled with sugar. The other parts of the world can be very different in how they prepare it. There is even fried biscuit dough on Chinese American buffets! A powdery wonderful Italian treat to make, we can never make enough of them! Just like at those old fashioned Italian feasts, oh yeah, back in Upstate NY all summer long you can enjoy these beauties at the local Catholic Church feasts. It's so simple, but a life long memory and made by most Italians all over the world, especially in East Utica, N.Y. Growing up in N.Y. this was a special treat that was at every Italian feast. You can also enjoy them in your backyard in a cast iron skillet pan right on your own grill. Here is a recipe, that has been passed down for many generations. Fried dough, Zeppole, pizza fritte, pizza fritta, doughnuts, and the South call them fritters! Where ever your way is to make this or want to call this, fried dough in any Region of the world is one of the finest addictions. Ours, Italian style is an amazingly easy dessert. 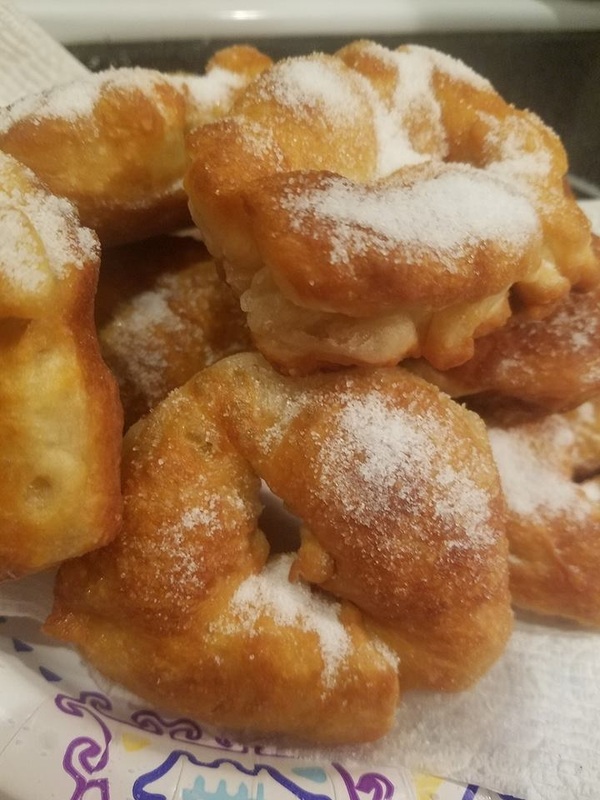 You can never have enough, and once you make it yourself, you will wonder how you lived so long without trying this wonder delicious dough fried with sugar. People would be lined up to buy dozens at a time. They sometimes waited for hours in that line waiting for them to make them fresh right in front of your batch. They went fast. They put them in a paper bag with powdered sugar or regular sugar on them. Everyone knew it was worth the wait! But boy did it piss me off as they bought all of them in front of me before I got mine. I would have to wait so long! But it was worth the wait for these Italian Pizza Fritta Fried Dough with sugar warm in a bag! A fried pizza dough with sugar on it! Mix until dough forms a smooth dough and if still sticky add a little more flour by tablespoon at a time. Place in a bowl, cover with a towel that has been dampened and wait until double in size as it rises. Stretch out around two tablespoons of dough into a circle poking a hole in the center like a doughnut. Place on a cookie sheet, lined with wax paper. In the meantime, heat the oil in a fry pan, on medium-low heat. Place a little piece of dough, (the size of a dime) in the oil to see if it sizzles and it hot enough. Place the stretched out dough into the oil and fry on both sides until golden brown. Take out of oil when done, place on paper towels to drain oil. Sprinkle with regular white sugar, powdered sugar or flavored sugar such as cinnamon and sugar. Note: Living in Florida with great weather all year round, we cooked this outside on our grill with a side burner, in a heated cast iron skillet, these are so light, crisp and delicious. 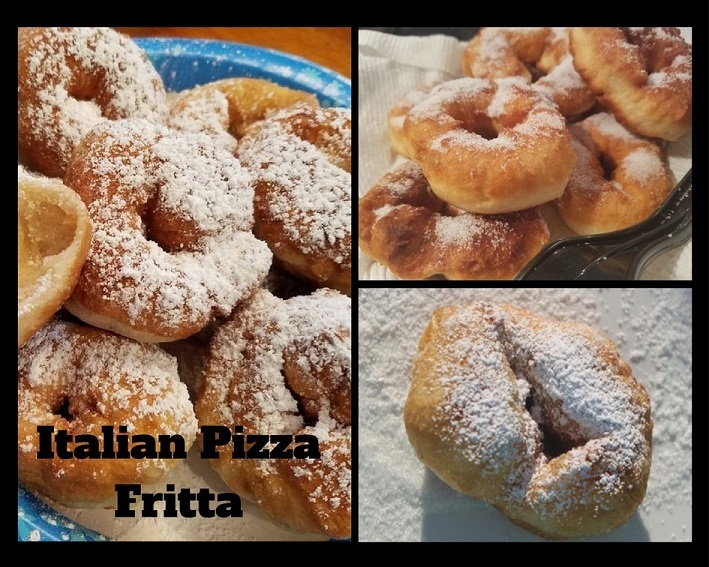 The fried dough has been a special treat for years in our family and you will find them at Italian Feasts in Upstate NY to be very popular. Always a great treat. Over the years this one has been passed down from generation to generation and is always a favorite with the children. Of course, if you aren't so lucky to have great weather to cook outside, just pour oil in a frying pan and fry your dough on both sides till nice and brown, add sugar and serve! Okay, as fab as that video was, it's missing something .. what could it be?? Oh, I know! I want to see some fabulous glamour! We all demand the fabulousness that will make YOU the next food network star! Put Captain Nemo to work filming you, get that lipstick on, and fry, girl, FRY! 'm fried, really sweet fried . They are simple and superb, at the same time, yum yum! yes... but the problem is I would eat the whole batch!! @trix oh yea... Well I need a stunt woman are you up to it miss medieval thing? I am not meant for stardom and captain Nemo can only steer a boat lol. Thanks for the fun comment you are too funny! @Daydreamer thanks for stopping by and thank you! this looks so good - quite addictive! I would eat the batch if I made this..i bet my hubby would help too! I remember eating these for breakfast when I was a kid. They look so yummy Claudia! Look at you go, girl! Hmm These are just my kind of sweet. Easy to make and not to sweet, not to mention addictive! Well done you on the video too! I love these, every so often we'll make them and they are gone in one day! This post made me gain weight!! Whether it's fried dough or zeppole, it's heavenly! My family used to make a savoury version at Christmas with anchovies in them. Not for me, but those who like "hairy fish" swore by them. I'll take the fishless, sugared ones any day. Gorgeous! These definitely deserve a line of people waiting for them. I can have this for afternoon tea. Looks delicious. Oh beautiful. Yes, they are in all the Italian feasts.Addictive, sweet,warm and yummy Italian goodness. This really reminds me of my grandmother...she was always frying up some kind of dough for me and my cousins. Brings back happy memories! You can't beat fried dough for a quick snack! Fried dough is truly one of the best treats! Excellent video. I think it's fun to eat and lovely to eat. I would love to try sometime. Would be so good with a cup of coffee. That's a cute version. Isn't it awesome that almost everywhere has fried dough. Oh, I'm with Trix...Food Network! YUM! This would cure my sweet tooth! Oh, my goodness! Fried, sugary - what an treat. These would go over so well at my house. Oh yes... sugared fried food :) These look so good! Your title totally grabbed me...I LOVE pizza fritte! And never thought to make it outside on the grill. Growing up, we made it in the fryalator with extra dough at my uncle's restaurant. Talk about sweet memories! Mmmmm! I could overdose on these. Just lovely! Such heavenly treats! I hope you saved me a few! Loved the video too! Cool! I love these pizza fritta! It's called Berliner here in Germany, only filled with jam. Claudia, the video was great, love to hear your voice it helps to get to know you better but lets see your lovely face! How do you stay so thin making all the yummy food you do? Oh my goodness, I can taste them now. Great recipe to share Claudia. This recipe just saved a pregnant lady in the midst of a craving for pizza fritte! My great aunt made it the second way when I was a kid. I always begged her to make them. My version with the biscuits is to use a soda bottle cap and make them like donuts with donut holes to match. You do have to watch them because they will burn quick in the hot oil. Then I dredge them in a mixtue of homemade cinnamon sugar. It satisifies my sweet tooth and my friends, too. I also remember going to local church picnics & festivals and always buying pizza fritta, 3 at a time with plain sugar. It was always a treat. The older woman & men was always behind the stands making the dough, frying, and dredging them in sugar. For some reason, I remember them as being rectangular with a cut in the middle, not like the one pictured. Since I moved away, I don't know if it has been passed on to the younger generations. We had something similar on the Boardwalk in New Jersey - it was so good! Gonna try this recipe soon! These remind me of a carnival! My kids will be so excited to try them. I've never tried anything like this before, but it looks yummy! Zeppole is a staple here in NJ too! :) In fact, they give you a bag of them for free at the local pizzeria with every to go order! Love your homemade ones! They look soooo delicious! Omg yum!!! 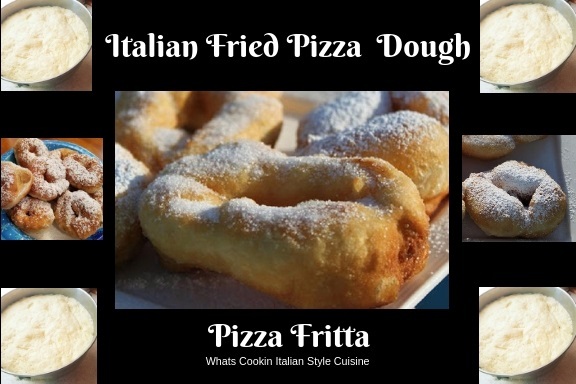 Never thought about fried pizza dough. I could snack on those all day!! Next time I make pizza, I'll need to make a double batch of dough! So yummy! This sounds incredible! I can't wait to give it a try! Yum, this reminds me of a treat called an elephant ear, but this looks even better because you get more of the crunchy edges with this treat. I would definitely wait in line for these! LOVE fritta! So excited to have found your recipe. Can’t wait to try it! ok this sounds heavenly and so deliciously addicting! Can't wait to try it! It's great that you pass the original recipes over the years in your family! 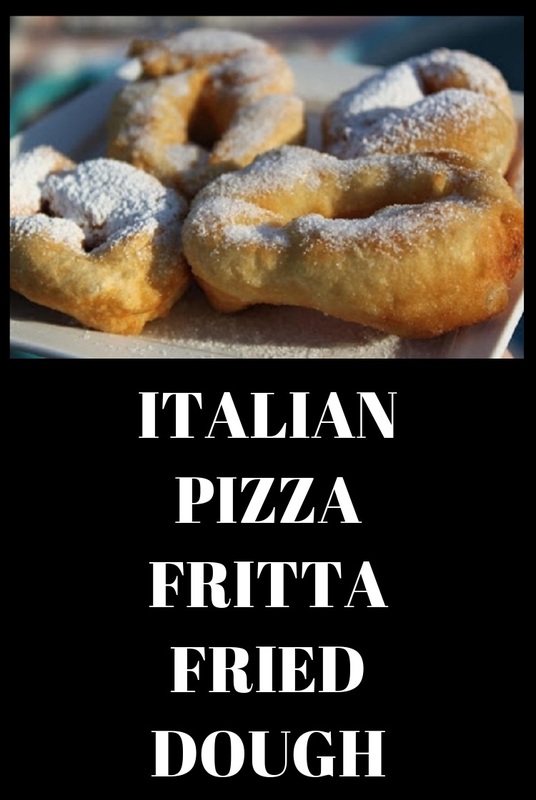 I wish I had written recipes from my grand parents.... And I never thought you can name fried dough pizza fritta, so cool! I've seen Zeppole on restaurant menus before but never tried it - now you have me craving some for breakfast! I love recipes that have been around for generations! This fried dough looks like the perfect recipe for my family! Thanks for sharing. I've never seen anything quite like this. Sounds delicious though. I wish I'd written down recipes from my grandparents. I'm sure they'd have had lots of interesting dishes to share. I love zeppole! They're popular at carnival too! Never made them myself. Going to try your recipe Claudia! 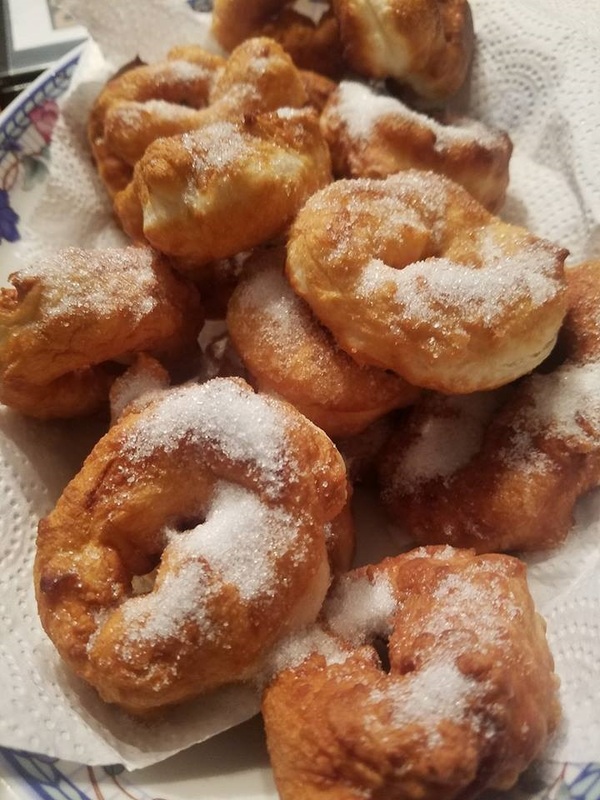 My grandmother married into an Italian family( she was Irish) she made fried dough like this all the time. Some times she would stuff them with ricotta and sugar mixture fold them over then fry. Sadly she passed without giving us the directions for the filling. Does anyone know what it is? I know it’s a long shot but worth asking. TJ was it Sfogliatelle? I have a recipe on my blog its a pastry that looks like a clam shell filled with ricotta.